Kinder Canada Hops Into Easter With Great Chocolate & CONTEST! 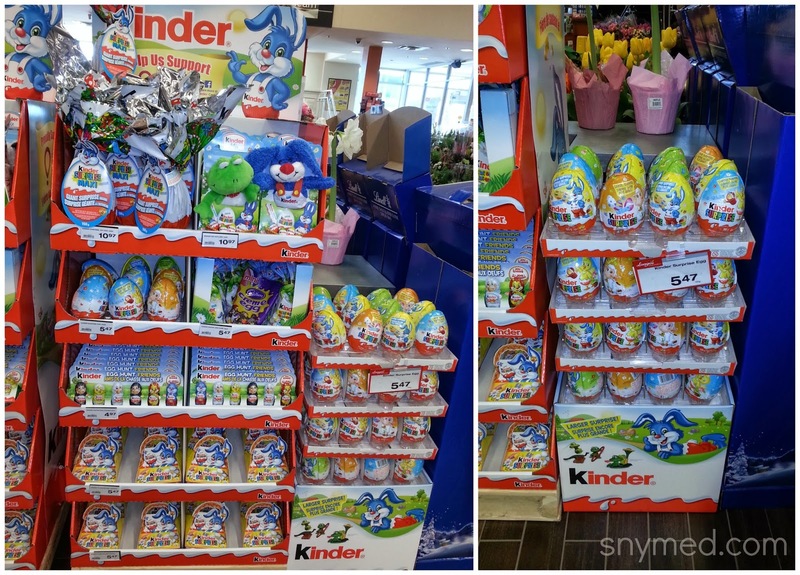 A Giant Easter Kinder Surprise Egg Display! 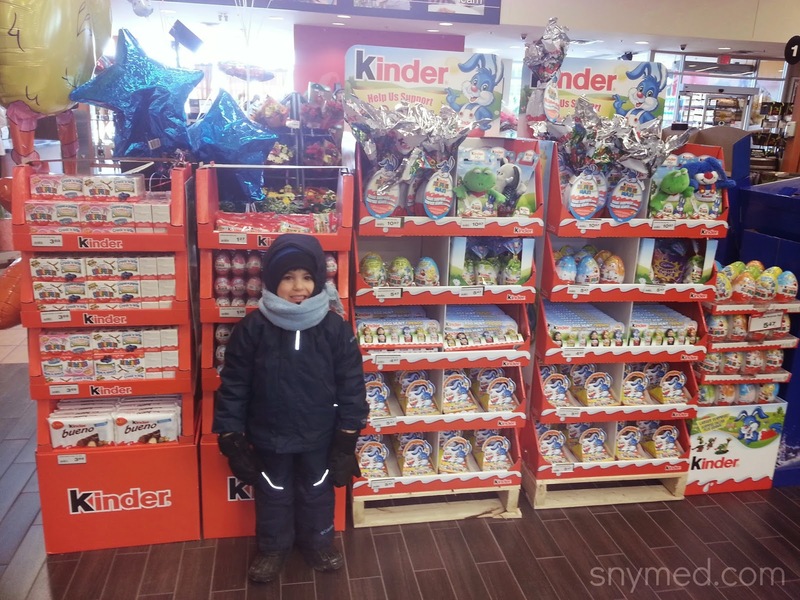 I was shopping with my son at the end of February, and came across the largest supply of Kinder Chocolate Surprise Eggs that I had ever seen! Not only were there multiple displays throughout the store, each and every display was humongous! Along with the usual Kinder Surprise eggs with white and pink tops, there was also Kinder Bueno chocolates and a gigantic display of Kinder Easter chocolates! It was my 3-year old son who first brought the massive chocolate egg display to my attention. "Kinder Eggs! ", he shouted with enthusiasm, as his face filled with a chocoholic's delight. For those of you wondering, this was a cold winter for Canada, hence my son's snowsuit, scarf and gloves worn in the supermarket! The Easter chocolate from Kinder was fantastic: packages of mini chocolate eggs, 100g Kinder eggs with Easter-themed toys, Kinder chocolate packaged with stuffed frogs, rabbits, and elephants, Kinder Egg Hunt kits, Kinder "Giant Surprise" eggs with giant-sized toys, a Kinder Mix package shaped like a house with a bunny on front, a Kinder Surprise bunny with a 4-pack of eggs shaped like a basket, a duckling-shaped Kinder Surprise 2-pack, and a variety of foil-wrapped Kinder chocolates with pictures of bunnies, chicks, chicken, lambs, and ladybugs! Phew! Because my blog posts were so popular about the 2013 Marvel Heroes & Disney Princesses Kinder Surprise Egg toy collection, and the 2013/2014 Kinder Surprise Egg toy collection, I'm showcasing the Kinder Surprise Easter 2014 Toy Collection, below! The collection prominently features frogs, with a few lions, a cat and bunny! I'm feeling pretty hopeful that it's Spring now, after a long, cold, Canadian winter! And with Easter around the corner, I'm already planning our egg hunt! I have fond memories of hunts as a child, and my dad would even give me a special Valentine's Day hunt, with rhyming riddles directing me to the location of the next clue or treat! In that same family tradition, I will be having a special Easter hunt for my 5 kids--with the goal of finding delicious Kinder Chocolate Surprise Eggs and Kinder stuffed animals! Proud to be a #KinderMom! For my 3- and 4-year olds, I hide the eggs and surprises in their rooms, as they become a little impatient if they don't find eggs right away. For my 6-year old, I do a more challenging hunt in his room with written clues made up of simple sentences and pictures. For my 7- and 8-year olds, I create a more complex hunt throughout my entire house with rhyming riddles that will keep them on their toes. As there is still lots of snow on the ground where I live and the ground is wet, I will not be doing an outdoor hunt this year. One year my son did not use a basket in his egg hunt, and (unbeknownst to me) put the small foil-wrapped chocolate eggs in his front and back pockets. Needless to say, his body heat melted them quite nicely and the eggs were royally smooshed! This year, I'll definitely insist on collection baskets for all of the kids! I created a pretty cute Pinterest Easter Board this year, with some Easter activities that I'll be trying out with the kids, including Tulip art that uses a fork to make the tulips petals, a paper watering can make out of tinsel, and a cute mommy duck and Easter duckling set made from painted stones. Kinder Canada Is Donating $25,000 to Children's Miracle Network! 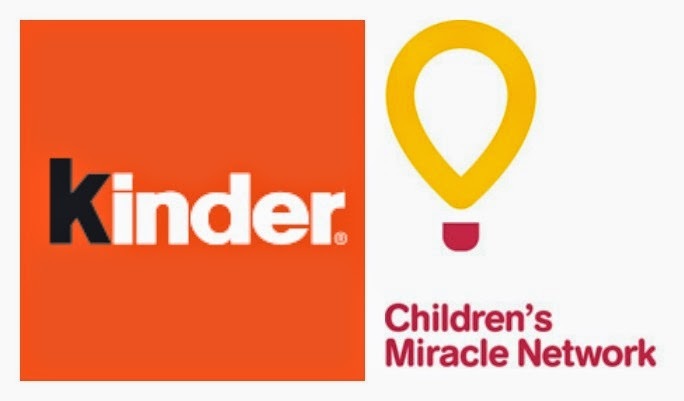 "Once again, Kinder has partnered with Children’s Miracle Network and will be providing 12 baskets to CMN hospitals. As well, Kinder will be donating an additional $25,000 to help support this non-profit organization dedicated to saving and improving the lives of children by raising funds for children’s hospitals across North America." Kudos Kinder Canada! 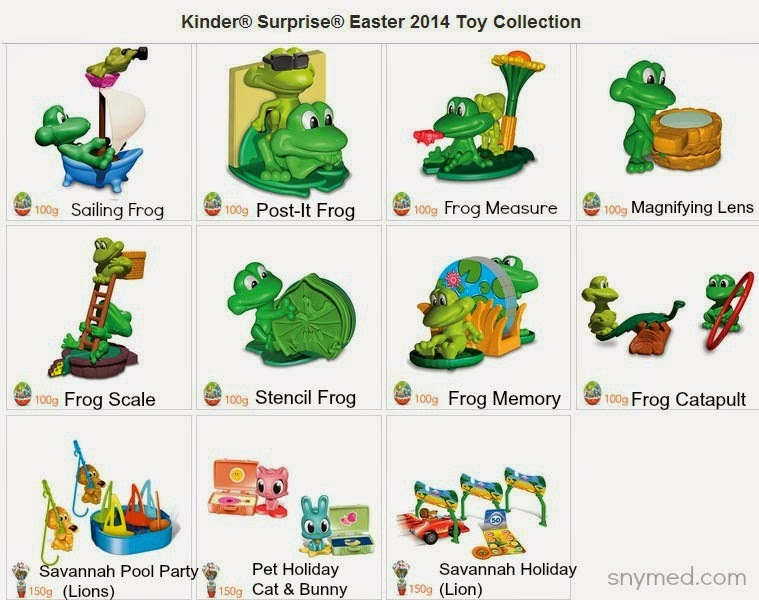 WIN a Kinder Easter Basket Kit! 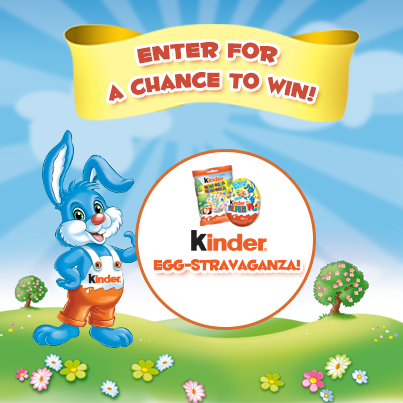 Kinder Canada is giving their Facebook fans a chance to WIN a fantastic Kinder Easter basket kit! They will be giving away one basket each day on the following dates: April 4, 6, 8, 10 and 12! Visit the Kinder Canada Facebook page on these dates, and simply participate in the question or challenge posted on their wall. Click HERE to enter contest, or see Rules and regulations HERE. GOOD LUCK! 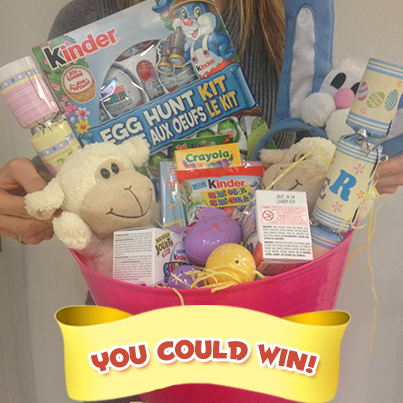 You Could WIN This Easter Basket on the Kinder Canada Facebook Page! 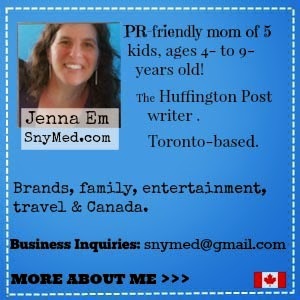 Follow Kinder Canada on Social Media! Do you participate in any egg hunts with your kids or grand-kids--or have any special Easter memories? Are you glad that Spring has finally arrived, and what weather are you experiencing where you live? We go to easter vigil the previous evening and than hunt for the eggs in side our house in the am, And have a great meal with all our close family. I take the grandkids to the local easter egg hunt every year, it is always a greag time. Often cold but hopefully this year it will warm up. I love Kinder products and that gift basket is awesome. Going to have to go enter it and hope I win it! I love that this year Kinder has a 'super egg' that's bigger than their normal egg yet smaller than the giant kinder egg! I like the little frog toys they've added. Kinder is my son's favourite chocolate, so thanks for the info about the contest. Great pics, this would be such a FUN win! The Easter basket looks great, my kids would love it! These are so adorable! I wish you a long spring and longer summer so you can enjoy some warm weather! We had a bad winter too but nothing like y'all! I love the egg hunt kits. I haven't seen any of these Easter toys yet. So fun! You're never too old for Kinder! I still buy those eggs at the SuperMarket check out when I'm in need of a treat. They're my favorite. Great prizes and a fantastic Easter display. I bought Kinder Eggs for our boys and have them put away for Easter - they are definitely a favourite here - chocolate and a toy who couldn't love that! Wow those eggs are enormous! I'm not sure I've seen any that big here! Wow that's a lot of Kinder Chocolate Surprise Eggs! So nice, I love the frogs! This looks so fun! love seeing the pics! That chocolate looks amazing! I'll take one of everything please! Wow, what an epic display! Hiding eggs in a child's room is really genius. Impatience is rampant in kids, especially with all of the excitement of Easter and candy and the bunny. I can see a lot of frustration coming out during an egg hunt for sure. Your son is so cute! Those eggs are enormous. Everyone loves chocolate! I love Kinder. Such great products. So many great things for Easter. Oooh... I really like the big ones. The toys inside are too cool. We usually have an egg hunt. The kids love it! I've always wanted to try a Kinder Surprise Egg! I think they're still banned here in the states - but I heard you can get them at a few select locations here in NYC if you know where to go. We will take our little one to the local easter egg hunt this year, they always do a great job and it's fun. HOpe it's not too cold this year. This is so cute! I love kinder- I used to munch on them all the time when I lived in Europe! Awesome Basket Will Have To Enter Thanks For The Giveaway! Kinder is so generous to the Children's Miracle network!